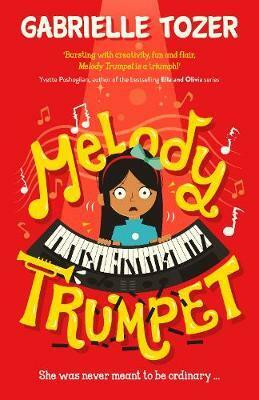 For Melody Trumpet, it’s about finding the extraordinary in ordinary! But Melody is a Trumpet. As the daughter of Viola Trumpet, the opera superstar, and Barry T. Trumpet, the renowned conductor, Melody is meant to be extraordinary, a musical genius to carry on the Trumpet legacy, not ordinary. Ten years on and many, many musical instruments and hours of lessons later, Melody is still searching for her melodic talent. This is a secret so big that it threatens to destroy the Trumpets’ reputation as iconic musical visionaries. In desperation, Melody is kept away from the world; if only secrets could stay hidden and the Battyville Elite School for Musically Gifted Children Debut Gala wasn’t so soon. With a little help from some unexpected friends – Clementine, Freddie and The Workshop – Melody may just find her talent and her perfect place. But she will have to start believing in what she can do, rather than what she can’t. This fun and clever story by the Gold Inky award-winning Gabrielle Tozer is her first for junior readers, and it’s a great adventure about finding your own voice and being happy with who you are. For ages 7+. Claire Atherfold is is the children’s book buyer at Readings State Library.